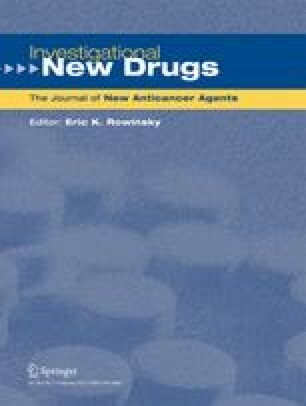 Background TAS-106 is a novel nucleoside analog that inhibits RNA polymerases I, II and II and has demonstrated robust antitumor activity in a wide range of models of human cancer in preclinical studies. This study was performed to principally evaluate the feasibility of administering TAS-106 as a bolus intravenous (IV) infusion every 3 weeks. Patients and Methods Patients with advanced solid malignancies were treated with escalating doses of TAS-106 as a single bolus IV infusion every 3 weeks. Plasma and urine sampling were performed during the first course to characterize the pharmacokinetic profile of TAS-106 and assess pharmacodynamic relationships. Results Thirty patients were treated with 66 courses of TAS-106 at eight dose levels ranging from 0.67–9.46 mg/m2. A cumulative sensory peripheral neuropathy was the principal dose-limiting toxicity (DLT) of TAS-106 at the 6.31 mg/m2 dose level, which was determined to be the maximum tolerated dose (MTD). Other mild-moderate drug-related toxicities include asthenia, anorexia, nausea, vomiting, myelosuppression, and dermatologic effects. Major objective antitumor responses were not observed. The pharmacokinetics of TAS-106 were dose-proportional. The terminal elimination half-life (t1/2) averaged 11.3 ± 3.3 h. Approximately 71% of TAS-106 was excreted in the urine as unchanged drug. Pharmacodynamic relationships were observed between neuropathy and: C5min; AUC0-inf; and dermatologic toxicity. Conclusions The recommended phase II dose of TAS-106 is 4.21 mg/m2. However, due to a cumulative drug-related peripheral sensory neuropathy that proved to be dose-limiting, further evaluation of this bolus every 21 day infusion schedule will not be pursued and instead, an alternate dosing schedule of TAS-106 administered as a continuous 24-hour infusion will be explored to decrease Cmax in efforts to minimize peripheral neuropathy and maximize antitumor activity. Hitoshi Matsushita and Akira Mita are employees of Taiho Pharmaceuticals. The other authors declare no potential conflicts of interest. This investigators received funding for this study by Taiho Pharmaceuticals.